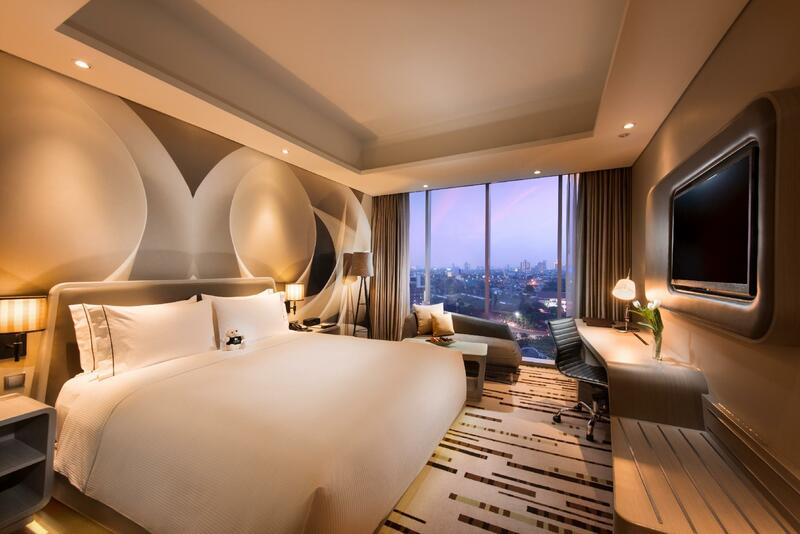 Heeft u een vraag voor DoubleTree by Hilton Hotel Jakarta - Diponegoro? Met een gunstige locatie in winkelen, bezichtiging van bezienswaardigheden, zaken in Jakarta, biedt DoubleTree by Hilton Hotel Jakarta - Diponegoro u een zeer aantrekkelijke plek om even te ontspannen in drukke tijden. Het levendige stadscentrum is slechts 3 km verwijderd. Dankzij de praktische ligging, biedt de accommodatie eenvoudig toegang tot alle belangrijke trekpleisters van de stad. Hilton Worldwide staat bekend om de hoge kwaliteit in services en haar vriendelijke personeel, en DoubleTree by Hilton Hotel Jakarta - Diponegoro maakt deze reputatie waar. Voor het comfort en gemak van haar gasten biedt de accommodatie 24-uur roomservice, 24-uur beveiliging, dagelijkse schoonmaak, taxi service, rolstoelvriendelijk. Alle accommodaties beschikken over goeddoordachte voorzieningen om een ongeëvenaard gevoel van comfort te garanderen. De accommodatie biedt talrijke recreatieve mogelijkheden, zodat u voldoende te doen heeft tijdens uw verblijf . 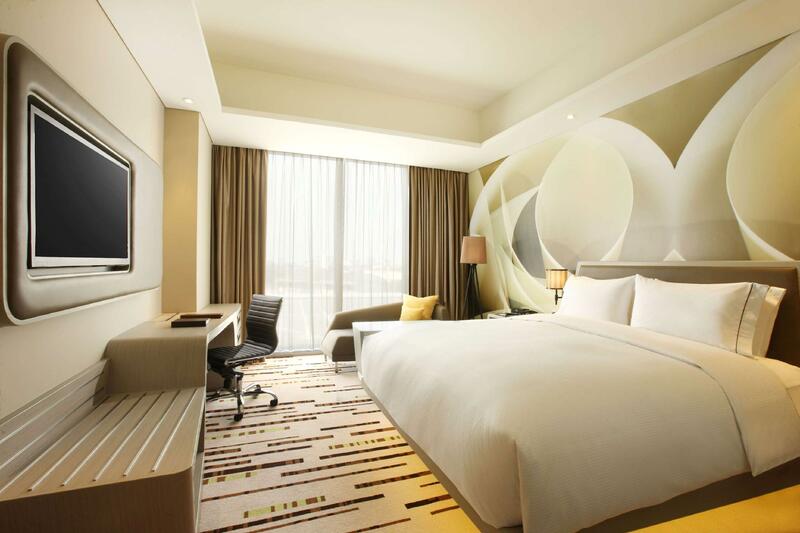 Geniet van een geweldige locatie en ongeëvenaarde services in DoubleTree by Hilton Hotel Jakarta - Diponegoro. De accommodatie accepteert geen vreemde valuta. Gasten dienen in de lokale valuta (IDR) te betalen. Een bad is niet beschikbaar in de executive kamertype. Bij de accommodatie is wifi uitsluitend voor het kamertype Executive en Suite gratis beschikbaar. Voor andere kamertypes wordt een toeslag van 150.000 IDR per 24 uur toegepast. Zeer goed hotel, dat voornamelijk bedoeld is voor de zakenreiziger. Kom zeker terug. We really love staying at this hotel. This is a brand new hotel with great facilities, breakfast area is really nice, they offer quite variety of food. The swimming pool area is very beautiful, we wish we have more time to enjoy the pool.. however, we woke up quite late and not manage to enjoy the pool. Parking area is quite big. there are some events happening when we stay over. The room itself is very modern and nice. We love the interior of the room. Overall, it was a great stay. Would love to stay back again. The Hotel needs more elevator, it has only 2 elevators, and during peak holiday season its quite busy and waiting time for elevator often up to 10 minutes to go up. Other than that, the hotel is good for the value, location, and service. Everything about the hotel was nice, as expected from Hilton. Though the price was higher than what I usually have for business trips, but it's still understandable because again, it's Hilton. The HDMI plug didn't work when I stayed there, but the response and solution from the staff were impeccable. Well maintend and decorated room, very clean, great bathroom. Very friendly staff remember your name. Just the breakfast should be improved a little bit, not for range of food but for the taste (so spicy and not so well cooked meat - e.g. beef). Overall great stay with great hospitality. Thank you! Amazing pool, but experienced once a bit shortage on the air-condition of the room despite the on call technical staff's effort to clean and fix, which eventually led us in getting a new room with excellent air condition. The food for breakfast is superb. good hospitality of the staff. Nice modern hotel staff are fantastic especially looked after my Son (I’ve creamand cake decorating) have 2 great pools one like a river with little bridges. Food is good and nicely presented. Breakfast nice too. pros : 1. huge pool with nature surrounding.. 2. warm welcome with chocolate chip double tree cookies during check In 3. lounge facilities with varieties of food and beverages. the evening cocktail is great. 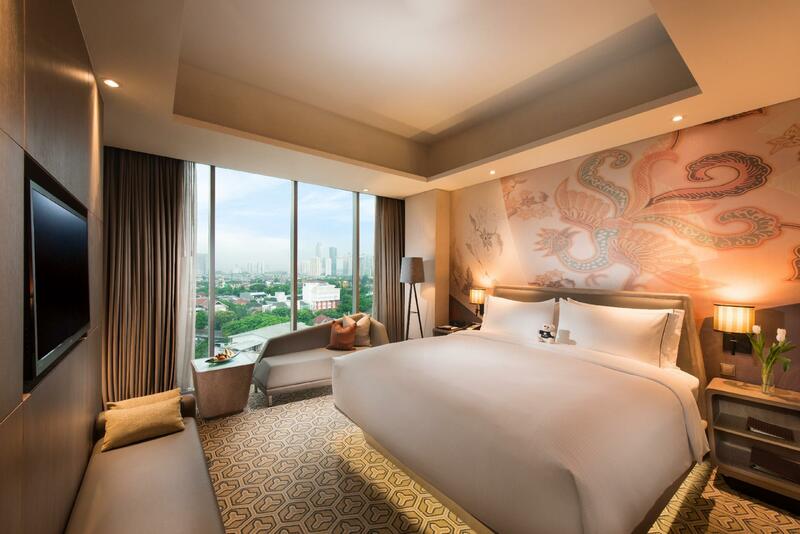 no kids below 12 y.o during certain hour which is great because you can have more quite and private session 4. king bedroom room is suitable if you bring your children with you. room is huge. nice bathroom and love the design of the lightings in the room. 5. perfect choice of hotel for family with young children 6. breakfast serves good quality and varieties cons : 1. no free Vallet parking 2. children below 12 y.o charged 50% for breakfast 3. leaking from the ceiling but staffs prompt to the issue quickly although it holds only for few hours. 4. make sure if you're on public transport or taxi to drop off in front of the front gate of the hotel not at the lobby. because they will straightly charge parking fee of Rp. 5000 although you only drop off for few minutes. Stayed here for the second time at new year. This year experience was not as good as last time. Staff were not friendly. Booked a specific table for new year and ended up at a different table because the staff had a miscommunication. New year party was disappointing since there were only a few of us at the pool. The only good thing was the welcome cookie. Though the location of hotel is secluded and awsy from major big malls, eateries or restuarants however facilties, room and restuarants within hotel are adequate to compensate lack. Overall, an excellent hotel. Last week we stayed here. Somehow we left "just" shampoo containers which were my son's favourite. Came back to hotel and asked several staffs what happened, I had to wait at the lobby for almost 30 minutes without any explaination. Lastly one came up and told me that the left items were "just" a shampoo containers and most probably had already been disposed. I was disappointed by the answer from a luxury hotel staff who should have a better manner and a good service exelence to a customer. It is only and just a container by the way. Other things I would like to comment is the room is soundproofless. We could hear clearly people talked next door.